Buy a $20.00 Frankie & Johnnie's Gift Certificate for only $14.00! Frankie and Johnnie's is known for their homemade recipes which span over 4 decades! 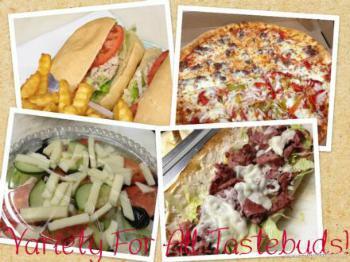 Check out their many pizza, calzones, grinders, wings, salads, and Italian dinners! Frankie and Johnnie's can cater your next big party with delicious Italian food! No cash or credit for un-used portion. Per Mass. law can not be used towards alcohol. Not valid with any other offer, discount or promotion. Only 2 certificates per visit. Frankie and Johnnie’s is known for their homemade recipes which span over 4 decades! Check out their many pizza, calzones, grinders, wings, salads, and Italian dinners! Frankie and Johnnie’s can cater your next big party with delicious Italian food! No cash or credit for un-used portion. Not valid with any other offer, discount or promotion. Only 2 certificates per visit.